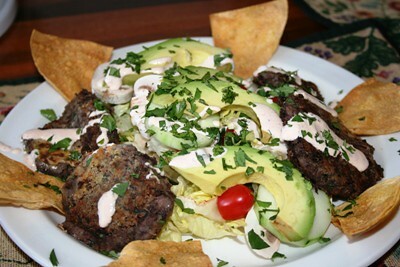 Fusion Salad, originally uploaded by All Things Mimi. Substitutions don't always work. Most of the time they do, but sometimes they don't. This was one of those times. I found a recipe in "Real Simple" magazine for chickpea patties served over a chopped salad with a Greek yogurt dressing. Great! But I didn't have any chickpeas. So I substituted black beans. It didn't really work. After dredging them in the flour and putting them in the hot pan, they immediately began melting. I think if you use softer beans, perhaps you need an additional binder, like bread crumbs or something. Anyhoo, they tasted great but the texture sucked. I mean really sucked. And I didn't make their dressing. I used some southwest ranch I already had leftover in the fridge. And it wasn't very photogenic, was it?